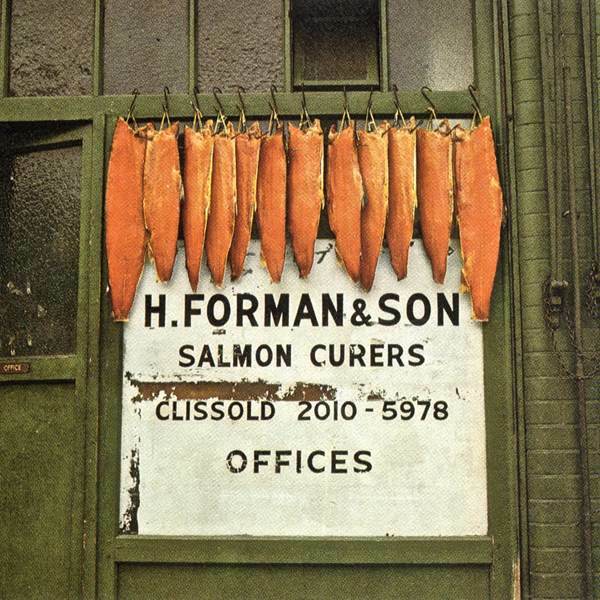 Smoked salmon is serious business at H. Forman & Son, the East End’s last smoke house, founded by Harry Forman in Stepney in 1905 and run today by his great-grandson Lance Forman at Fish Island in Hackney Wick. This gleaming enterprise in a snazzy new building on the River Lee – designed in the shape of a salmon and overlooking the 2012 Olympic park – might seem a million miles away from the East End of a century ago, yet Lance, now the fourth generation in the business, is resolute to uphold his family name as synonymous with the finest smoked salmon you could ever taste. Consequently, it is a matter of personal honour for him to ensure that the culture and artisan methods of fish smoking are preserved without compromise. And thus, keeping it alive here in the East End has become Lance’s personal mission, sustaining him with moral courage through an extraordinary sequence of challenges to the family business posed by fire, flood and the shameful caprices of the Olympic authorities. Harry Forman came originally from Odessa at the very beginning of the twentieth century, one of several who brought the technique and expertise of fish smoking from Eastern Europe to the East End of London and set up factories to provide smoked salmon for the Jewish population. 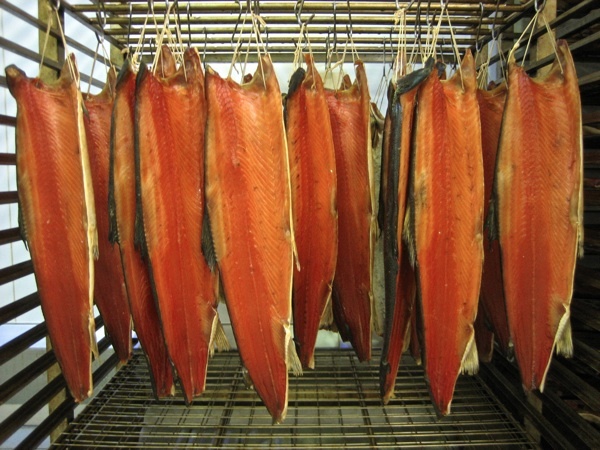 In the early days, salmon was imported from the Baltic and arrived pickled in barrels of salt which gave it a pungent flavour and limited appeal, but then supplies of native Scottish Salmon were discovered through the Billingsgate market and smoked salmon took off, becoming one of the most popular gourmet foods of the twentieth century. Crucial to this success was the development of a mild cure that enhanced the natural flavour of the fish, known as the London Cure. It all started well enough. Lance went out on the road as salesman and increased business by twenty five per cent each year, but then in 1998 when he took charge, the factory burnt down. 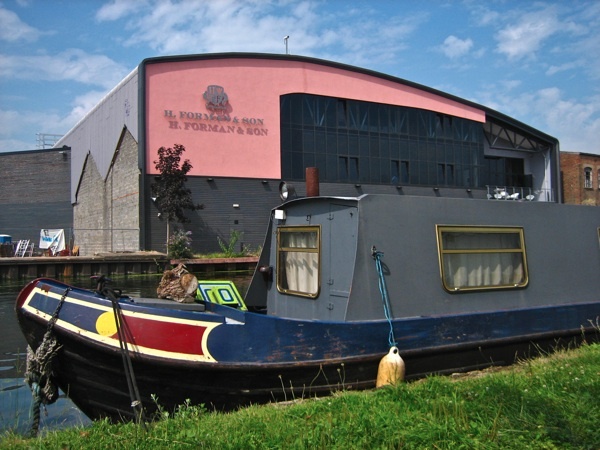 The premises were in Queens Yard, Hackney Wick, where his father had moved Formans in 1981. After struggling for six months in the remains of the building, Lance had the entire structure refurbished. Then in 2000, the River Lee overflowed and put the factory under three feet of water, contaminating it. But, undiscouraged by fire and flood, Lance chose this moment to build a fine new factory across the river on the Hackney Marshes, completed in 2002, barely a year before the possibility of the Olympics was announced, placing Formans squarely at the centre of the proposed athletic stadium. For the sake of three weeks of sport, two hundred and seventy businesses were displaced from East London, only seventy of which have yet re-established themselves. “You gave up the will to live,” exclaimed Lance, thinking back to that moment and placing a hand on his brow for effect, “Fire, flood and then a compulsory purchase order in five years!” Yet there was so much to play for. 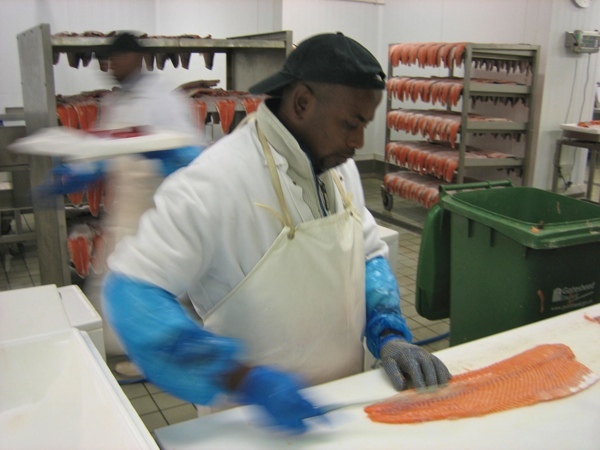 Smoked salmon in Britain began in the East End, before the Scots also began producing it, and Formans was the last company left here and Lance had Harry, Louis and Marcel standing behind him who had all worked their entire lives to carry the tradition forward. “You do feel the weight of history,” Lance admitted to me in a rare moment of vulnerability. The outcome was that the authority paid for Formans new smoke house, with a restaurant, an art gallery and a party venue overlooking the Olympic site. And, in what Lance Forman now happily describes a “one hundred and eighty degree turn,” the Olympic authority have adopted Formans as a venue of choice for corporate entertainment, even going so far as to claim the entire endeavour as a prime example of the legacy they hope to bequeath to London. Lance Forman is one of the happiest people you could wish to meet these days, with more schemes underway than the British government and, above all, proud to show off his shining new smoke house kitchen that his great-grandfather Harry Forman would be proud to see. 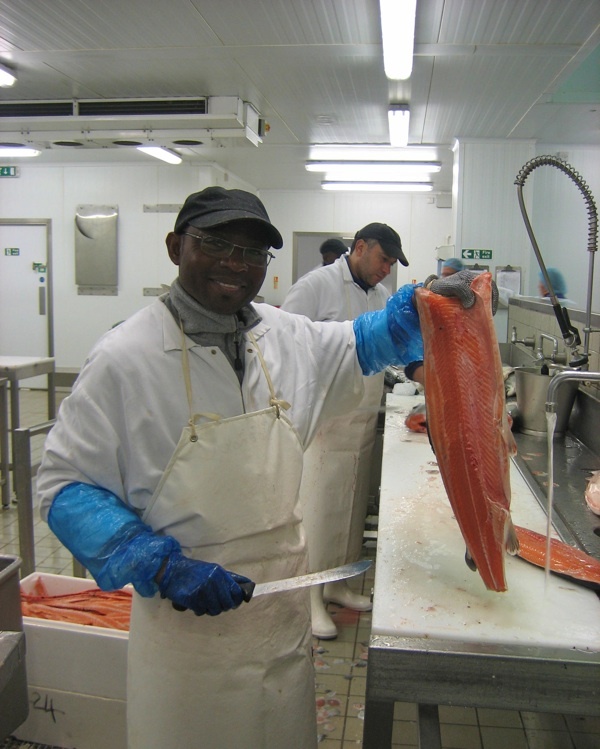 Family honour has been restored, and Lance exports his salmon around the world and supplies London’s top chefs and restaurants. “People don’t realise what smoked salmon is any more,” he informed me in a whisper of dismay, returning to the core of his passion, clasping his hands evangelically in his eagerness to expose the smelly, slimy varieties done on the cheap, sprayed with smoky flavouring and injected with water, which create the widespread perception of this subtle delicacy. 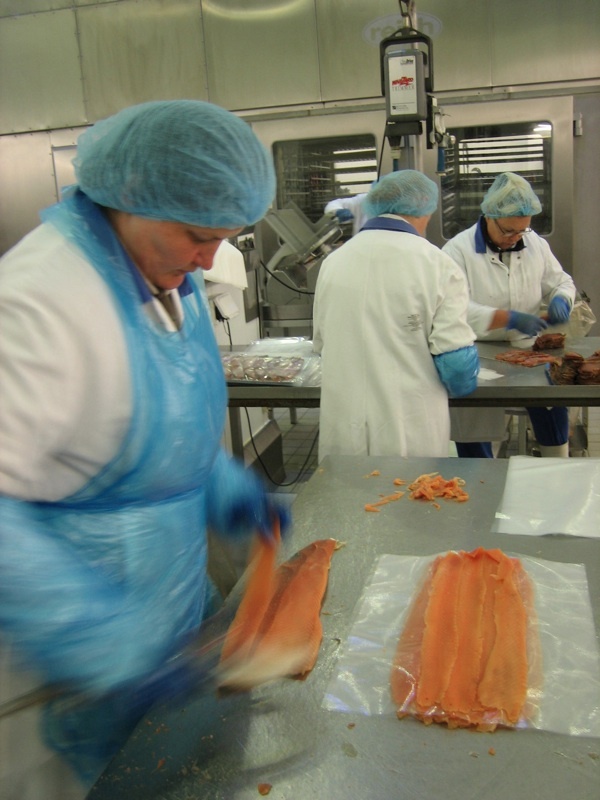 In Lance’s kitchen at Formans, I was able to witness the making of smoked salmon done entirely by hand, in time honoured method, by a highly skilled and self-respecting team of artisans. 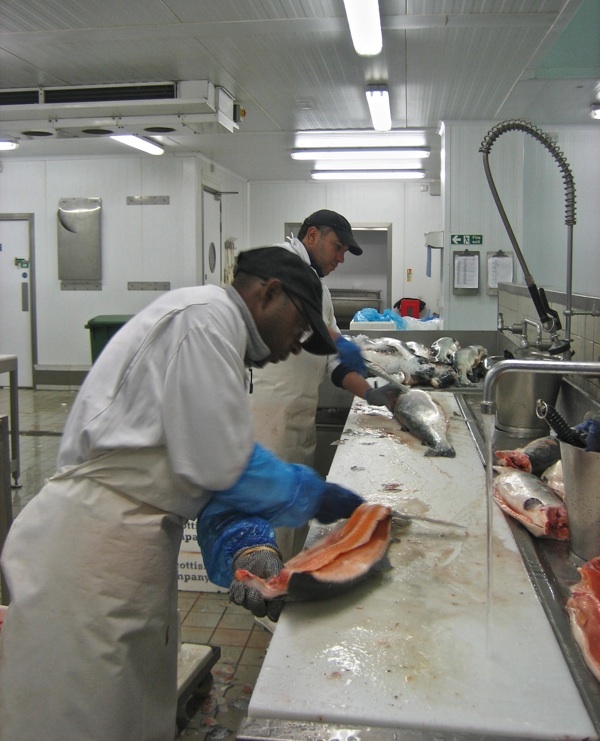 On the first day, the salmon is gutted, boned and filleted before being left overnight with salt to cure. Next day it is washed to remove almost all the salt and then hung in the smokebox to acquire its flavouring from the smoke of oak chips. 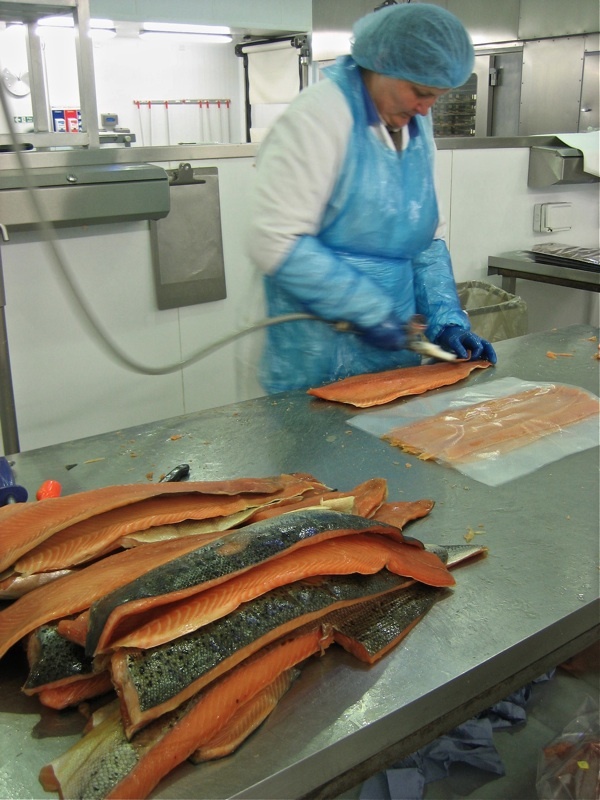 The staff are in at four each morning to slice up the smoked salmon so that it can despatched to restaurants and eaten fresh that day because, contrary to popular belief, it is at its very best when fresh. It was an extraordinary story, illustrating the tenacity and ingenuity that can be required to keep a family business alive. Lance Forman fascinates me as a lone business man who took on a war for the sake of culture and tradition, and thanks to his courage and cunning, the noble art of salmon smoking flourishes here in the East End. H. Forman & Son’s smokehouse and restaurant, facing the site of the 2012 Olympics. At the former H. Forman & Son smokehouse in Ridley Rd, Dalston. 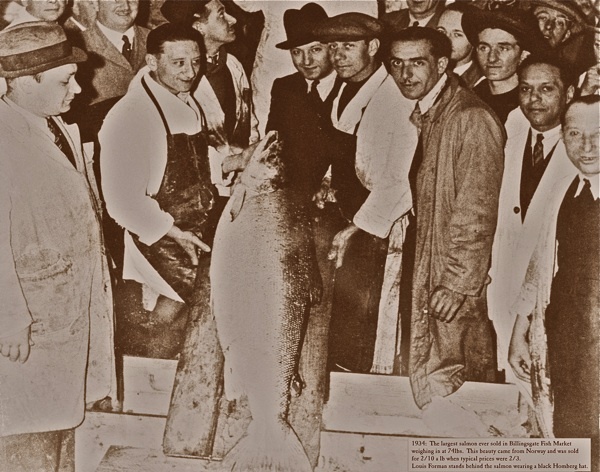 The largest salmon ever sold at Billingsgate Market was bought by Louis Forman in 1934, pictured here in a Homburg hat showing off his 74lb Norwegian trophy fish. What a great piece! Gentle Author – I love how you never shy from contemporary criticism. The 2012 Olympics? Shameful indeed. My respect for the organisation went down with Beijing, and continues ever downwards. Trade, politics, power and money (with a tiny dollop of sport to keep the masses entertained and looking the other way). I’m fascinated to know what happens to the waste (Bones, head, etc) Is it sold for reprocessing? (Cat food?) I’d love to know… I trained as a cook in the army and later cooked in a 4 star hotel. We served smoked salmon on a daily basis at the hotel. One of my favourites was to use the trimmings in an omelette. You should try it sometime. We’re regulars there…I love it, even though they do make it as difficult as possible to make a booking – last time six phone calls and three messages! Anyway the food is truly delicious, and it is good the business is thriving…they did well (eventually) out of the Olympics…but lots of sympathy to those that haven’t. I was wandering ’round ‘Hackney Wicked’ last weekend, having a great time checking out the local open studios, listening to lots of great free music, enjoying the sun with a tinny in hand. I was so caught up for a time that I didn’t notice the belly rumbling ’til I checked out some of the food prices – fiver for ropey looking noodles, or for oily falafel, when I stumbled past the food stand outside Formans. A big, fat, juicy salmon burger with lovely fresh rocket and the most amazing minty mayonnaise for 3 quid. Best festival food I’ve ever had, it filled me up but tasted so good I hung around the stall and had to force myself not to have another! With every paragraph of your story, I tasted that burger again. 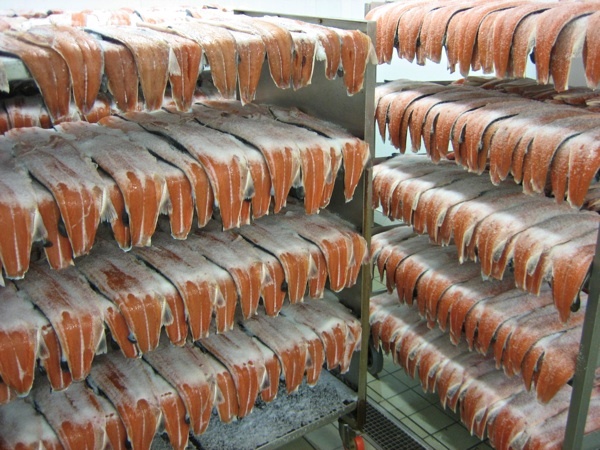 This story of Forman Smoked Fish’s multi-generation family business producing extraordinary smoked salmon is quite inspiring both from my personal interest in Jewish culinary history and representing the many fishing and fish industry professionals who are carrying on a tradition passed down to them by earlier generations of hard-working, caring families that have so much well-deserved pride in their work. 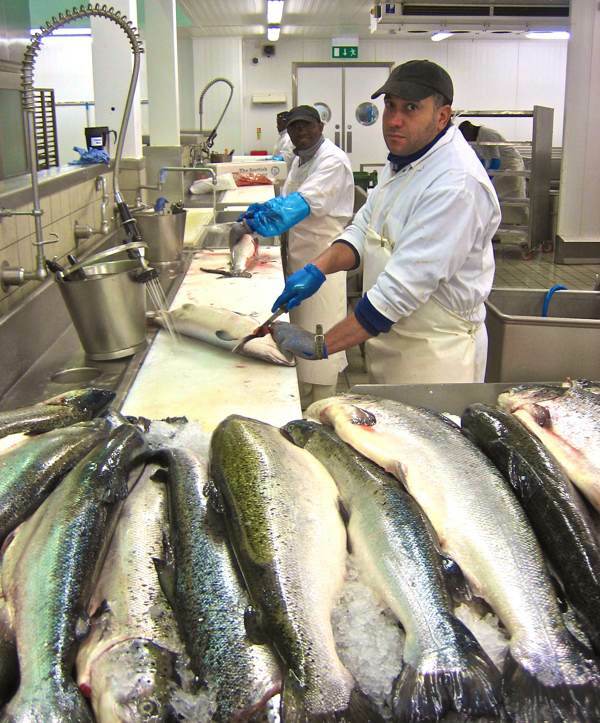 I had the honor of interviewing Lance Forman for my book, The Fishmonger’s Apprentice, published by Quarry Books. 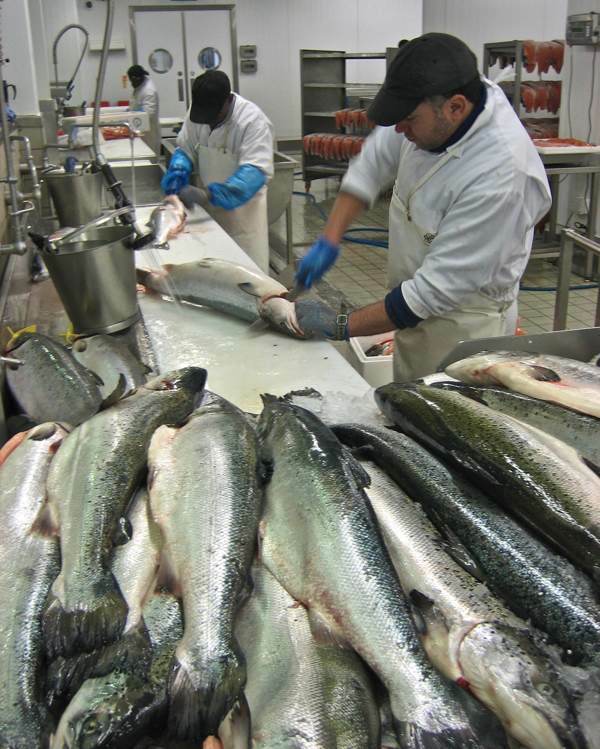 There’s a lot of smoked fish out there but few compare in quality and flavor of Forman’s products. My young son (9 yrs) is a fan of smoked salmon but sadly he has only ever tasted the supermarket bottom end of the market product. 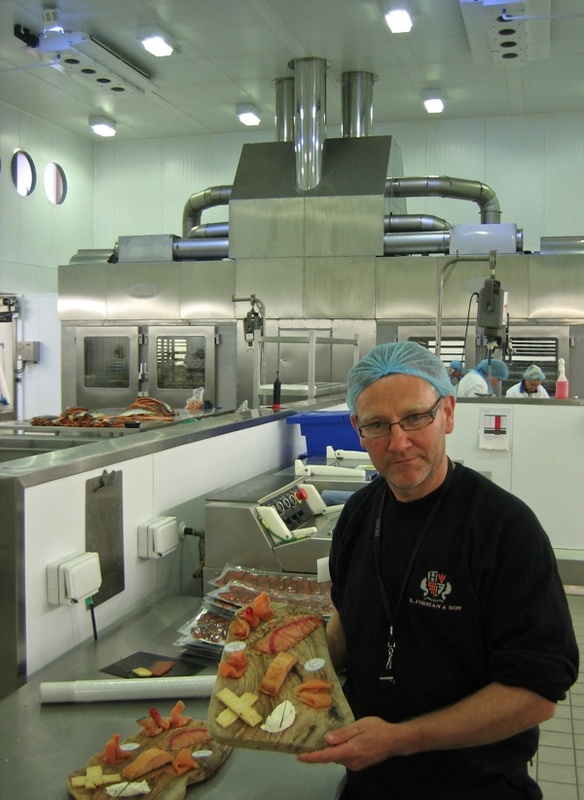 Do you have organised tours of the smokehouse and factory where he can see the ‘Real Thing’ being produced? I am sure he would appreciate the London method and would love to try some.